My oldest son, Korbin, turned 13 this summer. He has been bugging me to find him a project truck to work on/build/learn so that he can drive when he turns 16. Well, I have an older gentleman, Mr. Kilgore, that works for me that happens to have 2 Square Bodies he no longer drives. His wife wants them out of their yard. The blue 82 is loaded with power windows, locks, steering, brakes, tilt, V8/auto, etc...the white 85 is a stripper with a V6/auto and manual windows & locks, no tilt, but has ac. After looking them over, Korbin got his first experience in haggling. He offered $400 for the blue one. Mr. Kilgore came back with "I'll sell you the blue one for $400 or I will sell you both for $300." After Korbin thought about it, he said OK that's a better deal. Before we left it ended up being $250 for both if Korbin agrees to keep his grades up and that he does most of the work on them so that he learns about them. We had to go home and convince Mom that we need to bring them home. Mr. Kilgore offered to keep one at his place if we help him move it "out of his wife's view". That helped Korbin convince Mom that we could bring one home. We are going to bring the blue one home sometime in the next few weeks, I have to find a trailer to get it since it does not run...Looks like we have a new project to keep us busy. My other son, Owen, is 9 and he is excited to and wants to help out his big brother work on them. That was extremely generous of Mr. Kilgore, and I bet he did it all with a huge grin on his face. Nothing like the excitement in the eyes of a very young teenager when it comes to their first vehicle. Great story! I look forward to seeing how this goes! 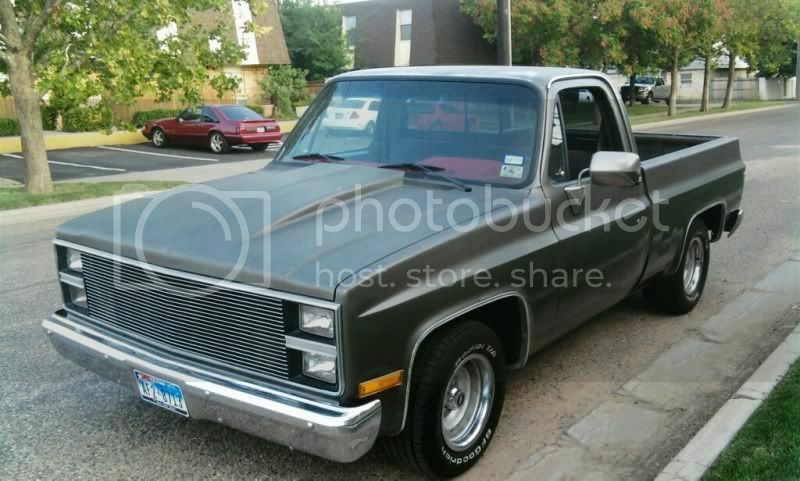 Project #1 "Pops"--1980 Chevrolet Scottsdale C10 3rd Generation in the same original owner family. GOAL: Restore to "almost" original. man great deal! 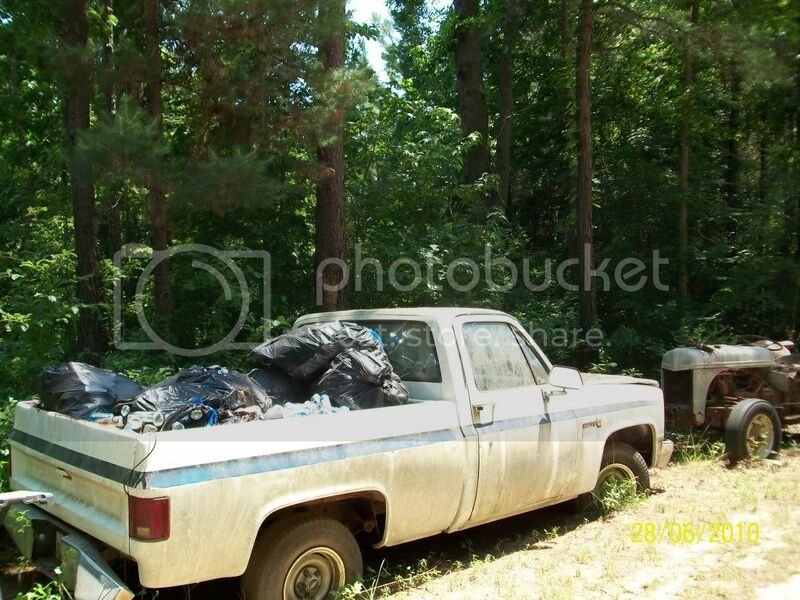 id like to have the base model v6 truck. 2004 z71, 96 z71 on 38s, 88 Chevy k5 blazer, 4in lift. 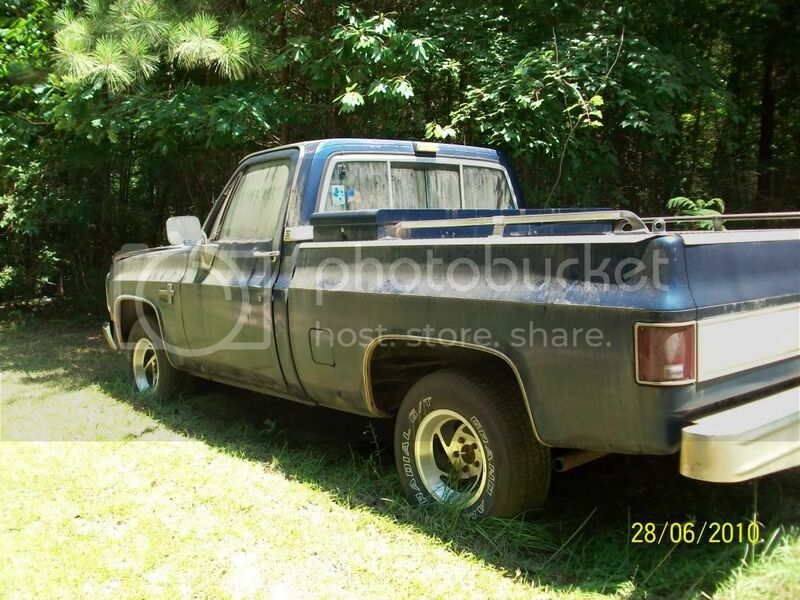 84 swb project, 82 SWB project , 84 chevy 4x4 lwb project, 88 Jimmy beater/highschool ride. 79 c30. 99 tahoe 4x4 project. and a bunch of parts trucks..
Hey guys, this is Korbin. thanks for all the feedback. I'm going to build the '82 and use the '85 as a parts truck. As for the rims on the blue truck, along with the grill guard and toolbox, they will be taken off. I plan just cleaning the '82 up and getting it running before I customize much. 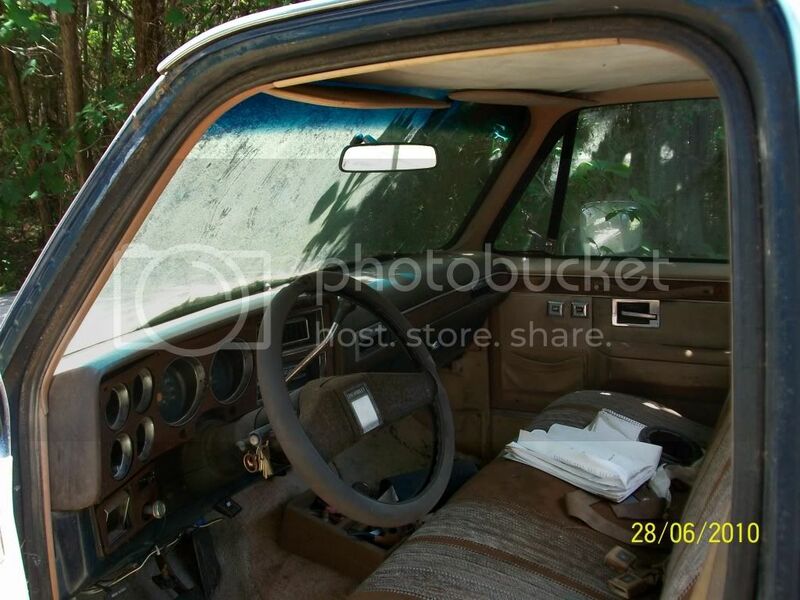 I want to rip out all the soft stuff in the interior ( carpet, seat covers, and headliner). The drivers side door is BADLY rusted and needs to be replaced. I"ll post again once the '82 is sitting in my backyard. thanks again guys. Last edited by Can't kech me; 08-27-2010 at 09:23 PM. Good luck my friend!! Looks like you and your dad have an awesome project coming in the future. Keep us updated. 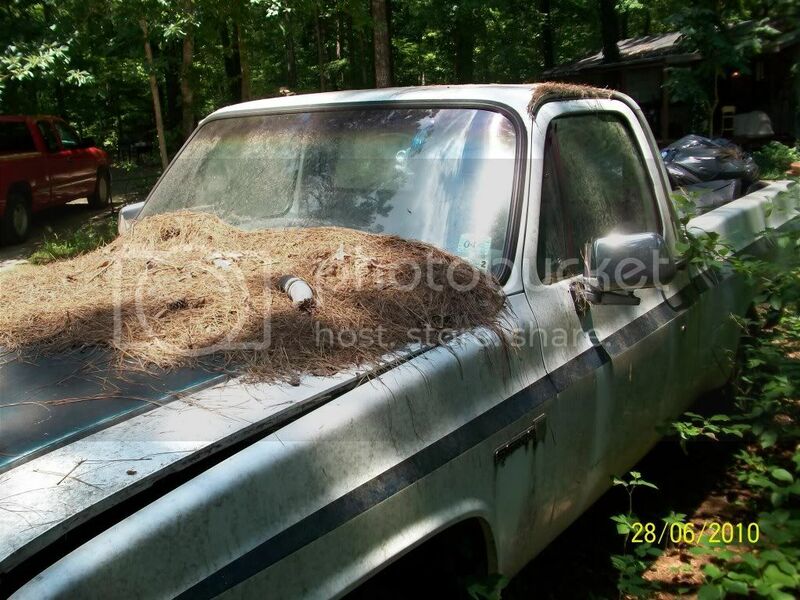 Aint nuttin like cruisin in a ride you built up yourself!! are the engines in both those trucks completely shot? "... Being "SQUARE".. is where it's at...."
Proverbs 15:30 .... "A Cheerful look brings joy to the heart, and good news gives health to the bones..."
That's a great start to a story. I will be subscribing to this one. The trucks look like good starts, but you do have a looooooong way to go. I hope your boys learn something from redoing these trucks. That kind of knowledge goes far. 83 LWB STD Cab 4x4 = went to the scrapper. Was my baby. Your very lucky to start young. I got a 76 that I am trying to build, and my parents are fighting me on it. It is a great experience to build your own truck, Im about 1/4 way through my 76 build and it has been great fun so far. Awesome story. Keep us posted on your progress. Sick man, awesome motivation, keep us posted, you going low or high? I think Korbin is going low, but not laying frame (I won't let him do that, this has to be a safe driver..) Possibly a 4/6 or 5/6 drop, we will see once we get some of the basics taken care of first. And a big to Korbin! Thats a pretty cool story! Good luck with everything. I just noticed ya'll live in Longview, my grandparents live in Troop, and my uncle works at Tyler Pipe. Maybe next time I visit my grand parents, when can hang out or something. That's fantastic! 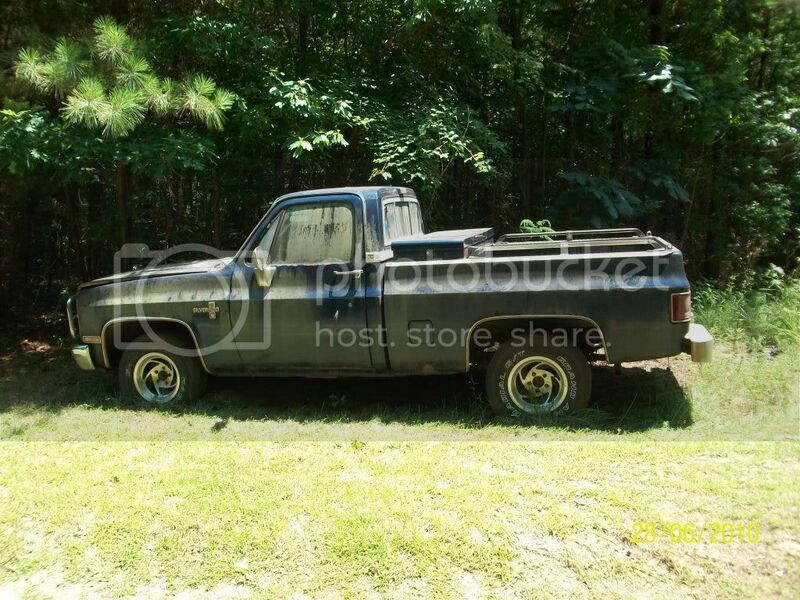 My boy turns 13 next March and we plan to get started refurbishing my 84 GMC for him soon to drive when he's 16. Last edited by Can't kech me; 09-01-2010 at 05:10 PM. My Dad (Korbin's Grandfather) worked at Tyler Pipe for 35 years. He left in 2006. What is your Uncle's name? Hey, I have an 85 Square body that has a 5/5 drop, and it sits perfect. As far as C Notches, you won't need them unless you go lower than 5/5, all you have to do is remove the factory bumpstops and your good. Look under the forums but everyone I have talked to/seen says they never hit either. Heres where I got mine from its all DJM so its good stuff. http://app.infopia.com/Shop/Control/...44235232251238. Only thing you have to do other than putting the kit on is if your running ralleye wheels you have to shave like an 1/8" off the calipers where the wheels hit. I don't know why but i like the rims on the blue 82. "As I walk through the valley of rice i fear no honda, for i have torque!" Tuning in for this build.